Wanalda began her designation in 2010 and after completing 150 hours and 4.0 credits of continuing education she was awarded with the de Souza Nurse Associate Designation in 2013. Continuing education is very important to Wanalda. 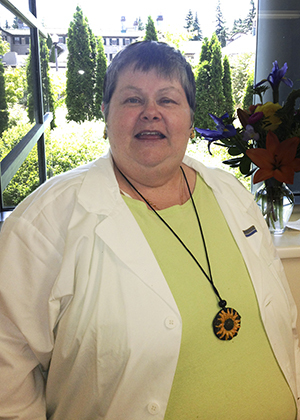 She believes that it is essential to stay up-to-date with cancer care knowledge as it is always changing. After taking part in de Souza Institute courses she was able to utilize these new skills in her practice and share useful knowledge with her team members. Not only has Wanalda used her oncology knowledge in the work place, she says as a volunteer and an active member of her community, her knowledge has been used daily. With a nursing career spanning almost 40 years, Wanalda encourages nurses of all stages, novice or experienced, to take part in the designation as it provides the tools to prepare nurses when dealing with cancer patients across the continuum of care. Regardless of years of experience within the practice areas of hospice palliative or oncology care, courses with de Souza Institute can be seen as an introduction, a pathway into a new direction, or a way to stay current within cancer care.